We all want a skincare routine that makes our skin look its best. So, we go to our local drugstore or beauty boutique and pick the potion we think will work best for our skin type. If we have oily, acne prone skin, we pick gel or foaming cleansers with tons of zit-zapping salicylic acids or benzoyl peroxides, paired with equally stripping toners and harsh spot treatments. If we have dry to combination skin, we pick cream cleansers and witch hazel toners to keep our pores tiny and our skin smooth. And, if we have sensitive skin, we pick anything on the shelf that says it’s made for our skin type and won’t disrupt our porcelain glow. Unfortunately, the pick and choose strategy doesn’t always work when it comes to great skincare. Those of us who buy numerous types of cleansers at the drugstore each month, know what it’s like choosing from a batch of universally-driven recipes. What most people don’t know is that your skincare products and daily routine should be customized to fit your exact skin type and lifestyle because we’re not all the same and our skin is the most unique and largest organ in our bodies. 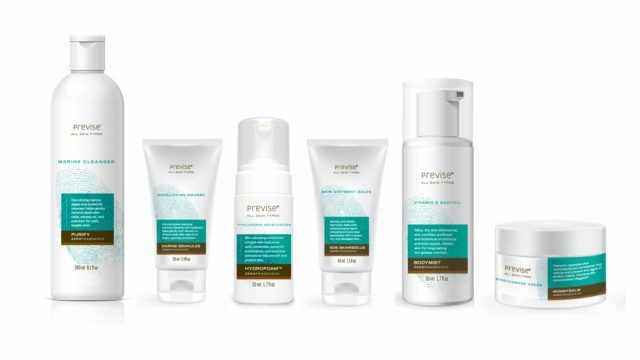 For those of us tired of the guessing game, Previse Skincare has devised a line of skincare products that tend to the personal needs of your custom dermis and finally ends the battle of “Pick a bottle, any bottle” in the drugstore aisles. The founder and CEO at Previse, Sean Patrick Harrington says, “Many people are unknowingly making their skin sick. Excessive UV exposure and use of aggressive ingredients damage the dermis. We know there’s more to skin than oily, dry, combination and problematic considerations. Working with our medical experts, we evaluate over eleven key characteristics, including baseline melanin, geographic location, and skin history to determine our client’s optimal regimen.” If he’s not a man who knows how to customize skincare for you, then we don’t know who is. At Previse they believe in the personalization of your skincare, and you can even go to the Previse website and take their Personal Skincare Consultation for free, to find your custom skincare recipe from the brand. 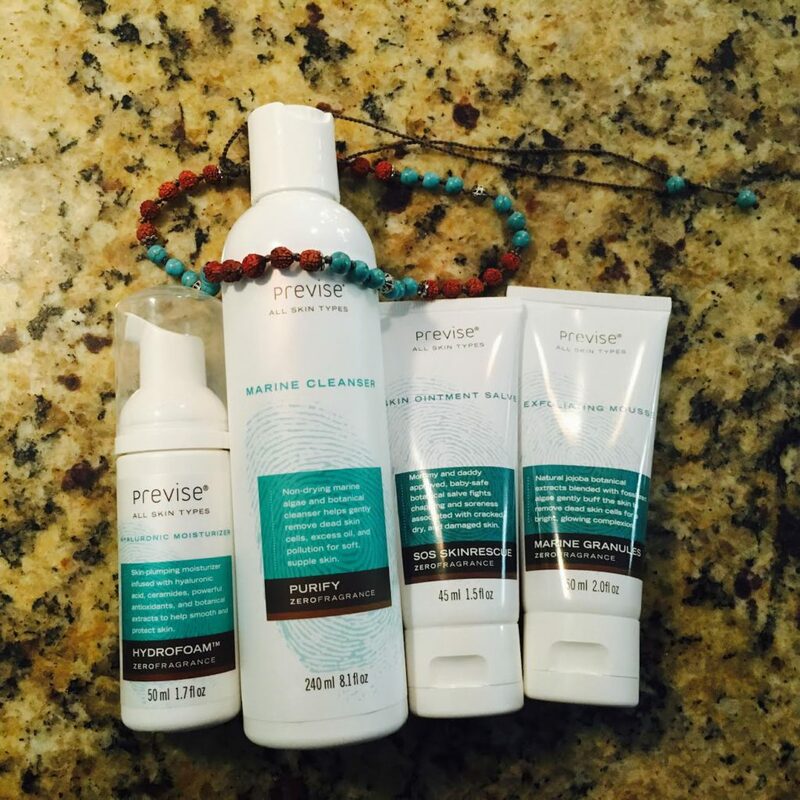 After your evaluation, Previse will determine the 3-minute, 3-step regimen that suits your skin type the best. You can create your own profile, chat with other members and purchase products all from one customizable experience. Like many new wave skincare products these days, Previse uses natural ingredients that feed your skin’s radiance and won’t strip it of its natural goodness. The difference between Previse and the “natural” products of today’s health-conscious market is that Previse is only sourced from sustainable ingredients and refuses to disrupt our ecosystem during the makings of its skin-loving potions. While a lot of “natural” products claim to be fragrance-free, a good portion of those on the market still have natural fragrances within them, and even natural scents can sometimes irritate the most sensitive of skin’s, making it hard to weed out the good natural products from the overrated ones. The Previse tonics are both hypoallergenic naturally non-toxic and are neutralized of all fragrances, perfect for moms looking to maintain their glow after childbirth. Our experts have tried the goods, and we know that there was no better smell than the smell of sweet nothingness, when dispensing the products into our palms. The less your skincare smells like your perfume, the better it is for your skin. And this stuff smells like pure goodness. Our experts at MyTopFace tested some of the Previse products and all four items tested were amazing on our skin. We tried the Previse Marine Cleanser, Exfoliating Mousse, Hyaluronic Moisturizer, and Skin Ointment Salve – we would recommend any of these products to a friend. Since there are zero fragrances, none of these products have a scent, and they all feel great on the skin. The Marine Cleanser is a gentle non-drying facewash with algae and botanicals used to rid the face of excess oil, pollution and dead skin cells that may clog pores or cause redness. The Marine Cleanser can be used with the Exfoliating Mousse for a deeper clean – just dispense the cleanser in your palms, add a bit of the mousse, rub your finger together mixing the products and work the solution into your skin. We love this mixture. The cleanser acts as a buffer for the exfoliate, making the exfoliating particles more gentle on the skin – whereas a lot of exfoliators out there can be too harsh, scratching the skin unknowingly. This recipe removes all the dead skin cells on your face and leaves your skin feeling clean and soft. One of the most important steps in our skincare regimen is to moisturize. Without moisture, our skin overcompensates for lack of oil in the skin and produces more sebum, causing more breakouts, so all those harsh astringents used to strip acne-prone skin of its natural oils, are actually working against you. The Hyaluronic Moisturizer from Previse is the is the perfect fix. It’s not heavy and creamy; it’s a foam that contains powerful antioxidants, hyaluronic acid, and ceramides that smooth and protect the skin. This moisturizer is great for oily skin types because it’s light and airy, plumps the skin and leaves it feeling soft and supple. It contains extracts of Fennel Seed, Marine Algae, Geranium Oil, Olive Leaf and Vitamin B5 – it won’t clog pores. You can apply a thin layer of moisture or build the product. It stays wet on your face after application, so let it absorb and reapply if you need more coverage. Lastly, we tried the Skin Ointment Salve, another amazing moisturizer. Like other ointments this botanical salve fights chapping and soreness associated with cracked, dry and damaged skin. This product is baby-safe and contains no petroleum (like most ointments), dyes, synthetic oils or PEGs. Most ointments we use on our dry, cracked skin leave a greasy film, that can last the entire day, which can be messy if using it on our hands. This salve is thin, light and absorbs into skin without leaving a layer of grease behind that could ruin clothing. It heals dry skin leaving it feeling soft and protected. With great skin, comes great accessories. When your skin looks and feels amazing, you want to draw attention to it. What better way to do that than with jewelry? One of the biggest trends on the runways right now is choker neckwear. 90s style is back in full force and is one of our favorite fashion eras. Great skin is always in style, so accessorize your newly perfected Previse complexion with Zacasha jewelry. Zacasha is known for its tassels, another huge trend right now, but we are really feeling the 90s vibes out there, and love their line of chokers. All Zacasha jewelry is handcrafted in Indonesian villages by artisans who work from home, while caring for their families. Each piece “…carries a message of peace and respect for our planet,” says designer, Jennifer. One of our favorites is the Choker Shiva featured below. The colors are perfect for the fall season and can easily be worn in the spring and summer months, as well. 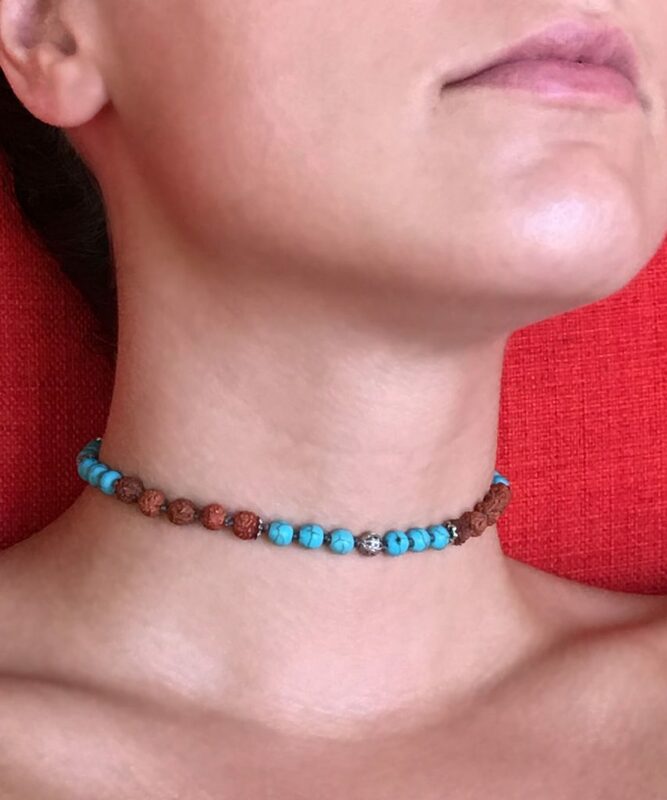 It’s been crafted with Ganitri seeds and turquoise beads, handmade in Bali. Ganitri seeds are used by Buddhists to make traditional Mala necklaces, a priest necklace, symbolizing a gift of blessing. Ganitri seeds are said to have human-healing properties when worn, so as Previse heals your skin, Zacasha will heal your mind, bringing you tranquility and concentration. This choker is adjustable, comfortable and trendy. Wear it to be a fashionista and most of all, wear it to show off your best accessory: your Previse Skin. At Mytopface, we are beauty and fashion conscious; that’s why we know great products and great trends. Previse will make your skin better, and Zacasha will upgrade your wardrobe. With these two finds, you can’t lose. Previous articleThe BrowGal Helps You Get Perfect Eyebrows!